I'm at the end of my first month and was using the Log Note described some generalizations about how I ate for the month, and what I plan to change the next month. I was just writing a few short paragraphs, and it is only when I try to save it that it tells me it is too long. First, I'd like to request a longer note option. If that isn't possible, break note up into multiple notes automatically, or at least stop me from typing when I reach the limit. Related to this, I'd love a love the full report to have a nice summary over a range. I can list every day for 4 weeks, but what I really want to see is the data I can see for the 4 weeks when I hover over a macro-nutrient. For example I can see, how I have 2g of saturated fat per day, I'm short on Fiber, I can hover over and see what most of my fiber came from, so I know what food to eat more of, or what food I don't eat I should try. Thanks for the Feedback, @david_g I will pass this along to our developers, and we will see if we can alter this functionality to be more user friendly! 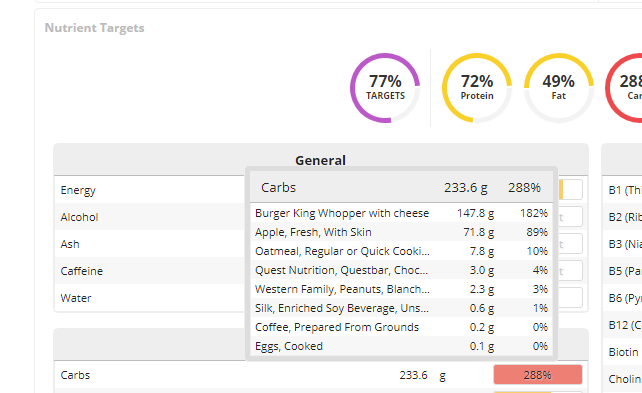 You should be able to see top contributors for Macro and micronutrients by hovering over the item in the nutrition report.